The latest instalment in the Chivas Regal ‘Made for Gentlemen’ series of limited edition pack designs is a “celebration of craftsmanship, generosity and a passion for travel”. Chivas has partnered with British brand Globe-Trotter in the fourth year of the series to design exclusive collectibles. Containing the newly re-designed Chivas 12 bottle, the Chivas 12 ‘Made for Gentlemen’ by Globe-Trotter limited edition gift tin is inspired by the age-old tradition of travellers applying decorative stickers onto their luggage. Featuring some of the most iconic cities around the world, the bespoke stickers adorning the tin have been hand-drawn by illustrator Andrew Davidson and represent the global footprint of Chivas. To commemorate the partnership, Globe-Trotter has for the first time created a 20” trolley case for the modern gentleman. The Chivas 12 ‘Made for Gentlemen’ by Globe-Trotter carry-on case features a colour matched burgundy vulcanised fireboard and customised lining detailing the Chivas signifier. As the ultimate luggage piece, Chivas and Globe-Trotter have also created the Chivas 12 ‘Made for Gentlemen’ by Globe-Trotter steamer trunk. 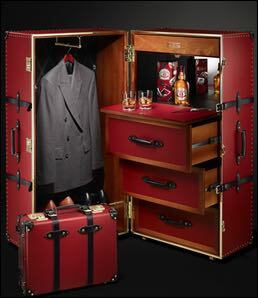 The made-to-order creation is the ultimate luggage piece complete with a mini bar for the perfect service of the modern gentleman’s bottle of Chivas Regal. A bespoke backdr op expressing the modern heritage of both brands lines the trunk interior with additional compartments for suits, watches and other travel essentials. Underlining its authenticity, the design of the trunk nods to the art of whisky making with handles crafted from American white oak in honour of the casks that influence the complexities of Chivas 12 Year Old, and a hand engraved copper plaque made from a retired Scotch whisky still. All proceeds from the sale of the first Chivas 12 ‘Made for Gentlemen’ by Globe-Trotter steamer trunk will be donated to The Prince’s Trust charity. The Chivas 12 ‘Made for Gentlemen’ by Globe-Trotter limited edition gift tin is available globally at RRP US$40 in travel retail. The Chivas ‘Made for Gentlemen’ Carry-On Case is available through Globe-Trotter retail outlets with RRP £950. The Chivas 12 ‘Made for Gentlemen’ by Globe-Trotter steamer trunk will be for sale in the Globe-Trotter flagship store in London from October at RRP £12,000 (with all proceeds donated to The Prince’s Trust charity). Celebrating global cities and to honour this exclusive partnership, Chivas Regal global brand ambassador, Max Warner, has created the ‘Chivas Maximilian’, a fresh and modern twist on a classic cocktail, the Whisky Mac, and takes inspiration from all four corners of the world. Muddle a piece of ginger in a mixing glass. Add whisky, earl grey tea, and simple syrup, then stir with ice .Strain over fresh ice. Gently pour dry red wine on top. Garnish with star anise, and twist of lemon (discard the peel).